Is Annie D'Angelo Lesbian ? Annie D' Angelo is a former American makeup artist popularly known for being music legend and all-rounder Willie Nelson's wife. She is the proud mom of two children which she had with Willie. Angelo lived a simple life until she met her famous husband and after that, her life totally changed. Willie Nelson found a perfect match in Annie D' Angelo after getting experiences in his former three marriages. There is no information regarding her former relationships before marriage with Willie Nelson. Annie D' Angelo was born on August 27. She belongs to white ethnicity and her nationality is American. Angelo was into makeup from an early age and growing up wanted to turn her interest into a suitable career. Annie D' Angelo is an American professional makeup artist who did makeup on actors and actresses. She was into that profession during the 1980s. Angelo has worked as a makeup artist for movie projects like Gleaming the Club, Where's the Hell's That Gold?, The Rosary Murders, Hot Pursuit and Bachelor Party. Her life changed when she met her present husband Willie Nelson. After being married to Nelson, she now works at her home taking care of her husband and family. She also takes care of Willie's business matters. Angelo manages Nelson's business matters as well. 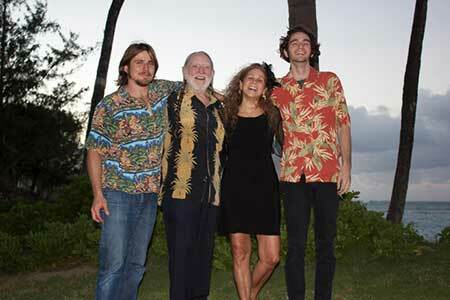 Her son Lukas Nelson has also taken on his father's footsteps as he also went on to become a musician. He has a rock band named Lukas Nelson & Promise of the Real where he is the lead. Angelo's another son Jacob Micah Nelson is professionally an actor and a composer. Angelo is set to launch her own line of cannabis products named Annie's Edibles as mentioned in the news outlet of 2017. The line is said to feature specially prepared foods which contain cannabis like Hand-crafted artisan chocolates. Artisan chocolates are beneficial for people who have diet restrictions and is suitable for people who have Celiac Disease and Gluten allergies. Angelo's net worth is not estimated but her husband Willie Nelson has a huge growing net worth of $25 million. Willie even owns a marijuana company which raised $12 million by expanding into many new markets. Angelo worked as a markup artist but now works at her home taking care of her husband and family. She also takes care of Willie's business matters. Angelo is married to music legend and all-rounder Willie Nelson since 1991. Their marriage ceremony was held in Nashville, Tennessee on September 16. The couple first met on set in 1986 when Angelo was a makeup artist for movie Stagecoach's actors and actresses. Eventually, they started dating and married after five years of relationship. Angelo gave birth to two children named Lukas Autry Nelson born on December 25, 1988, and Jacob Micah Willie Nelson born on May 24, 1990. She is a stepmom to Willie's five children from his previous relationships. Nelson's first marriage was to Martha Matthews. The couple who tied the knot in 1952 divorced after 10 years living together. In 1963, he married Shirley Collie and their marriage lasted for eight years. After separating from his second wife, he married Connie Koepke in 1971. The couple called it quits in 1988. Her marriage with Willie is her first but Willie married thrice before marrying Angelo. Angelo and Willie share a huge age difference and she is denoted as a backbone for her husband as she is always present for him. They are a loving couple who are living a sound life in their Hawaiin home in Maui and celebrated their silver jubilee marriage anniversary last year. Her husband suffered from a serious illness like pneumonia and emphysema and she was right by his side the whole time. He was a smoker so his lungs got congested due to over smoking and even damaged his wrist by over playing guitar for which he had to do carpal tunnel surgery in 2004. Nelson even had to go through a stem-cell therapy in 2015. Annie D' Angelo married Willie Nelson on September 16, 1991, in Nashville, Tennessee prior to their first meet in 1986. Annie D' Angelo gave birth to son Lukas Autry Nelson on December 25, 1988. He was her first born. Jacob Micah Willie Nelson was Willie and Angelo's second born child who was born on May 24, 1990.